So we may or may not have had to buy a second bag of Halloween candy because we ate most of it before it was time for trick-or-treating… Next year we’re not buying candy until October 31st! 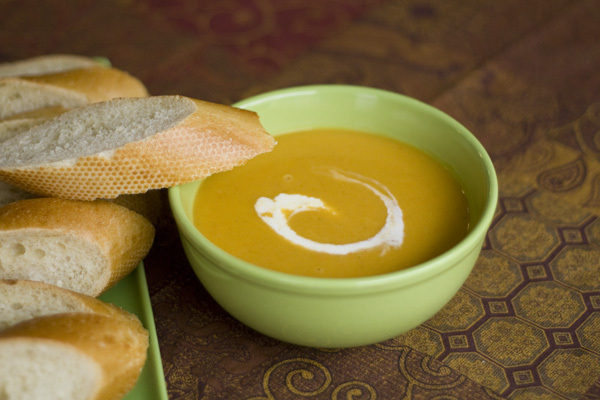 Now that Halloween is over, we’ve been craving wholesome meals made with plenty of vegetables. 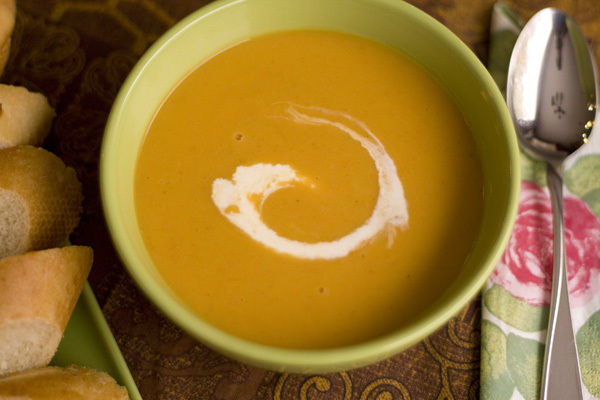 This creamy butternut squash soup is made with carrots and parsnips so it’s a nice immune system booster and really hits the spot when it’s -10 C in Calgary! 1. Melt the butter or margarine in a heavy skillet. Add the diced squash and cook without stirring until browned underneath, about 6 minutes. Then stir the squash and cook until browned on all sides, about 4 more minutes. Remove from the skillet. 2. Melt the coconut oil in the same skillet and add chopped onion, parsnip and carrots. Saute for 5 to 8 minutes. 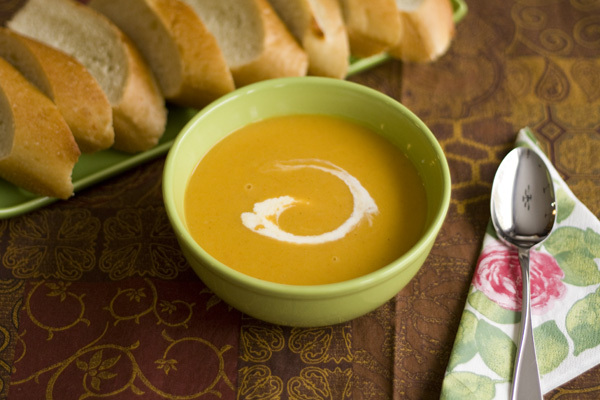 Transfer the caramelized squash, onion, parsnip and carrots to a large pot. Add 2 cups of vegetable stock, or more if needed, until vegetables are covered by a layer of the vegetable stock. Add coriander, salt and pepper. 3. Simmer for 15 to 20 minutes. When vegetables are cooked, remove from heat and stir in 2 cups of coconut milk. 4. Puree the mixture in batches until smooth. Return to pot. 5. Warm up the soup before serving and add more vegetable stock if needed. Add salt and pepper to taste. 6. Serve with a fresh french baguette and a scoop of sour cream if desired. Like this recipe? Subscribe on the right to have free recipes delivered straight to your Inbox! Welcome to Like Mother, Like Daughter! Welcome to DJ and Silvia's vegetarian cooking blog! We update the blog weekly. Every Sunday you'll find a recipe, review or something else that has peaked our interest in the wonderful world of food. Enter your email to follow our blog - you'll get links every week to our FREE recipes! All images are copyright by Like Mother, Like Daughter. Please do not use our content, photos and/or text without our permission.